The Australian Motorcycle Grand Prix, otherwise colloquially known as the Australian MotoGP™ is a celebration of motorcycles, mates and adrenaline. Cast against the stunning backdrop of Bass Strait, it brings a coastal breeze through the area. The Australian Motorcycle Grand Prix is one of the final races of the year, and it is without doubt one of the most compelling races on the MotoGP™ calendar. Depending on the Championship standings leading into Phillip Island, the race is often a make or break affair with many riders over the years having either boosted or seen their Championship aspirations evaporate at ‘The Island’ (for example, Andrea Dovizioso finishing 13th in 2017!) 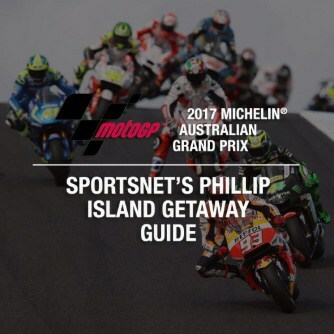 The Phillip Island Grand Prix Circuit is one of the fastest and most iconic circuits in the world with MotoGP™ riders often rating it as one of their favourite tracks because of it’s flowing nature and the multiple passing opportunities it provides. In addition to the speed, the circuit also experiences strong winds that adds a layer of excitement and difficulty to the race! You can guarantee you’ll witness some of the most exciting and thrilling MotoGP™ action of the year at the Australian Motorcycle Grand Prix! Our Michelin Australian Motorcycle Grand Prix 2018 packages were priced from between $679 and $1309 (per person, twin share) depending on the accommodation and number of nights selected. You can expect our 2019 packages to have similar pricing and inclusions. 3-4 nights’ accommodation at a selection of Melbourne CBD Hotels, or Philip Island resorts or Pre-pitched tents at Phillip Island. Friday-Sunday return coach transfers from Southern Cross Station to Phillip Island Grand Prix Circuit. 3 Day General Admission ticket to the 2018 Australian Motorcycle Grand Prix at Phillip Island Grand Prix Circuit. The display hosts 15 Aprilias including world title-winning machines of Rossi, Biaggi, Capirossi & Marco Melandri as well as the race-winning Cagivas of Lawson and Kocinski. 2018 Australian MotoGP™ Official Programme. The Australian Motorcycle Grand Prix is the premier motorcycling event held in Australia each year. 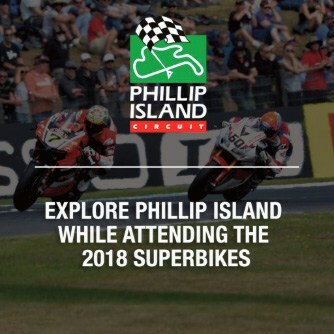 It is held at the Phillip Island Grand Prix Circuit, 140km South of the vibrant city of Melbourne well-known for its sporting culture, live entertainment, restaurants, bars and cafes. At the 2019 edition of the Australian Motorcycle Grand Prix you will have the opportunity to witness the world’s greatest riders of two-wheeled machines – including 6-time World Champion, Marc Marquez, the mercurial Jorge Lorenzo and of course, arguably the greatest of all time, 39 year old, Valentino Rossi – tackle the 4.44km Phillip Island Grand Prix Circuit at speeds of up to 350km/h. The 2019 season will mark the first year that Jorge Lorenzo will ride for MotoGP™’s most dominant team, Repsol Honda, making the switch after a largely unsuccessful two year stint with Ducati. He will be joining long-time rival, Marc Marquez, making their partnership a fiercely intriguing prospect! Australian rising star, Jack Miller will also be into his second season on a Ducati (and a factory bike at that!) and there is a chance that he could be the first Australian on the podium since Casey Stoner, who last achieved the feat in 2011. If you’re interested in joining us at the 2019 edition of the Australian Motorcycle Grand Prix, then please pre-register your interest by completing the Enquiry Form below. Once our official Australian Motorcycle Grand Prix 2019 travel packages & deals are released, one of our friendly travel consultants will be in touch to discuss our range of package options and your travel requirements in further detail. *To get priority access to our Australian Grand Prix 2019 travel packages and be one of the first customers contacted when packages are released, please place a fully refundable $50 deposit after completing the Enquiry form at the bottom of this package page. This will ensure you’ll receive your first choice from our range of ticket and accommodation options. Cheers and hopefully you can join us for what’s sure to be an unforgettable experience at ‘The Island’!